How long does it take to lower cholesterol? That is a question that seems to plague almost anyone who suffers from high cholesterol. 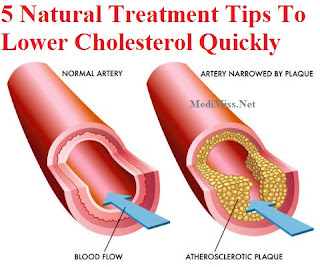 If you're suffering from high cholesterol, lowering your cholesterol level can never be fast enough; whether you're seeking a natural way to lower cholesterol or via some other alternative treatment. According to an article by CNN in November 2006, "more than 70 million Americans live everyday with some form of heart disease." And the number is expected to rise steadily over the next 10 years. Heart disease is America's number one killer and probably, the number one killer in the industrialized world. The myth being perpetuated that cholesterol is never high before the age 40 is exactly that - a myth. Don't believe a word of it. The facts necessitate a quick guide to lowering your cholesterol quickly - preferably opting for a natural and alternative treatment for high cholesterol. But first ... for some good news. Cholesterol ... contrary to popular belief ... is not the cause of heart disease. The inflammation of arteries does that. Heart attacks occur in people with normal cholesterol levels. That's right. There's a lot of misinformation being passed around that cholesterol is bad - that cholesterol is the cause of heart disease. That's so far from the truth. In fact, your body needs cholesterol to stay healthy. Your body uses cholesterol to produce hormones, vitamin D and bile acids to digest fat. And the truth of the matter is - your body requires only a small amount of cholesterol in the blood to meet these needs. So why should you worry about lowering your cholesterol levels and maintaining it preferably at less than 200mg./dl.? Because failure in doing so can lead to the inflammation of your arteries ... and that is when cardiovascular events like heart attacks will occur. It's only when you have too much cholesterol in your bloodstream (referred to as hypercholesterolemia) that problems start to arise. And this is where you need to pay attention. Because a high cholesterol level ... let's say ... north of 250, can and will lead to problems such as atherosclerosis. Atherosclerosis clogs arteries including your coronary arteries (arteries that feed the heart) and if left unchecked overtime, will lead to heart disease like angina and heart attack. This is why you need to lower your cholesterol level and why it's so important to keep those levels in check. Statins such as Zocor and Lipitor may be powerful, cholesterol-lowering drugs and helps to some extent, but ... whether you believe it or not ... these can cause more damage (liver toxicity is a common side effect) than good to your body in the long run. You don't need these ill-effects creeping into your life just as you're about to kick back and enjoy your retirement. Don't get me wrong ... I'm all for taking prescriptions drugs under doctor's orders if no other alternatives are made available. I'm sure you'll agree with that. But I'm about to show you 5 tips you can go about lowering your unhealthy cholesterol levels without drugs right now - and fast! You must have heard of monounsaturated fats. Usually found in some types of nuts like almonds and walnuts, olive oils, canola oils and avocados. These "healthy" fats lower "bad" cholesterol (LDLs - Low-Density Lipoproteins) but at the same time, help maintain the "good" cholesterol (HDLs - High-Density Lipoproteins). Your doctor can vouch for the fact that consuming monounsaturated fat instead of saturated fat can lower your cholesterol levels quite drastically. You would have probably come across health advice about lowering cholesterol such as, "Replace whole milk with skim milk," "Cut down on that refined sugar," or "Dump butter for margarine." Most of that information is true except for dumping butter for margarine. Margarine increases the bad cholesterol and even worse, lowers the good cholesterol - almost tripling the risk of a coronary heart disease. Don't believe the TV ads and stay away from margarine. Dr. Allan Spreen calls margarine, "plastic butter." And he has a point. Why? Because being hydrogenated, margarine is in fact one molecule away from actually being plastic - no kidding! To put it mildly, you're actually about one molecule away from eating Tupperware. You're more than welcome to carry out a simple test to prove this. All you have to do is leave a container of butter and a container of margarine out for a while and watch. It will only be a matter of time when you see flies hovering your container of butter - avoiding the margarine altogether. If it's not good enough for flies, you know you're in trouble! Lowering cholesterol without drugs begins with this very important step - simply limit your consumption of saturated fat. Saturated fat is said to stimulate your liver to produce LDLs - or bad cholesterol that would simply clog up your arteries. According to Dr William Castelli, co-author of Good Fat, Bad Fat, he recommended that a smart diet to help lower cholesterol would take into consideration the amount of "bad" fat consumed per day - ideally being 20 grams a day. And that's just for those who are healthy. A good idea would be to simply check your food labels when grocery shopping to get a sense of how much fat grams will be going into your body at any given day. Make this a habit because a simple precautionary measure like this can mean a lot to your long-term health. Also, take note of trans-fatty acids. The name probably already gives it away - it is another bad fat. Trans-fatty acids are chemically processed and will not only raise your total cholesterol levels but can also lower your HDLs. These acids are usually found in deep-fried fast foods, biscuits, shortenings and packaged pastries. They're not usually indicated on food labels so be extra prudent about your food choices. You will want to get a blood test if you find yourself gaining weight, losing hair, feeling depressed, feeling more tired than usual, more sensitive to cold than usual and sudden stiffening of your joints. These could be symptoms of an underactive thyroid - medically termed as hypothyroidism. Diagnosing this condition with a blood test could nip the problem in the bud and save you from a rising cholesterol level. While you're at it, ask your doctor to check your homocysteine level as well. Recent studies are pointing towards homocysteine as a better predictor of cardiovascular events. And there is a connection between hypothyroidism, homocysteine and heart disease. If you have an underactive thyroid, this prevents the absorption of B vitamins - causing homocysteine levels to shoot up. The result is a 300 percent risk of a heart attack. A good homocysteine level is under 8. Anything above that and your doctor should be able to prescribe you some supplements. These supplements would usually center around vitamins B2, B6, B12 and folate. Can I have my eggs back? Yes, you definitely can. According to the British Nutrition Foundation's Nutrition Bulletin, dietary cholesterol in eggs "has no clinically significant impact" on heart disease. In fact, eggs are such a rich source of nutrients that avoiding them could cause more damage than good to your health. I mentioned homocysteine. Well, according to a study from Harvard Medical School, choline may be effective in managing homocysteine. And where is choline found? You guessed it. Eggs. In fact the best source of choline is egg yolks. But if you're someone with elevated cholesterol or heart disease, you should check with your doctor about the number of eggs you can consume per week. Such cases are usually limited to two eggs per week. Stop smoking and get moving! Those are two obvious actions to take to keep your body in good working order. If you're overweight, you can be sure that your HDL readings will be low. Shed the weight and watch your HDLs rise. It's quite difficult to raise HDLs by dieting alone. You will need the combination of regular exercising and watching what you eat. Exercising helps in lowering your triglycerides (a blood fat linked to heart disease) as well. If you are serious about lowering your cholesterol levels, pay attention to triglycerides. Because apart from clogging up your coronary arteries, high triglycerides can lead to kidney disease and pancreatitis. There is not much to be said about smoking that has not been said already. It's just bad. Smoking depresses HDLs considerably. It is a cause of heart and blood-vessel disease and basically causes irreversible damage to your overall health. There are no two ways about it. Smoking kills. Here is a rough checklist to monitor your cholesterol levels and as always, consult with your doctor. Keep it less than 130mg./dl. Anything above 160mg./dl. is high. The higher the better. 35mg./dl. or less increases the risk of heart-disease. Keep it less than 150mg./dl. Anything above 200mg./dl. is high. This is the combined measure of all blood cholesterols. Keep this less than 200mg./dl. Anything above 240mg./dl. is high. Thank you about this subject. The web translator is too bad,but I understood most of it. Great points... High cholesterol becomes a problem when an imbalance of the good and bad cholesterol occurs. Too much bad cholesterol or not enough good cholesterol can give you a high cholesterol problem. The excess cholesterol will then clog your arteries, putting you at risk of heart disease and strokes.